Former England football captain David Beckham has revealed that on reaching the US after being axed from the English side last month, he had called up his friend and Hollywood star Tom Cruise to seek advice on how to deal with the distress and get over his despair. He described Tom as a positive minded person. “When I got to America, I phoned Tom. He's a great guy to be able to speak to because he is a very positive-minded person. It is good to have people like him around you at that point,” The Mirror quoted Beckham as saying in an interview. Becks and the “Mission Impossible” hero have been friends, and once the latter had traveled all the way to Spain to watch the former England skipper play for Real Madrid. 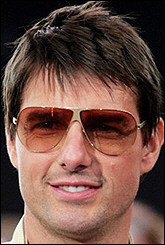 Tom himself had his own brush with adversity recently after movie giants ‘Paramount’ dumped him.